When the shiny new MacBook Pro with Touch Bar goes head-to-head against last year's model, which computer wins? The 2016 MacBook Pro with Touch Bar has met a lot of criticism. But all anyone really wants to know is, is it time to upgrade? 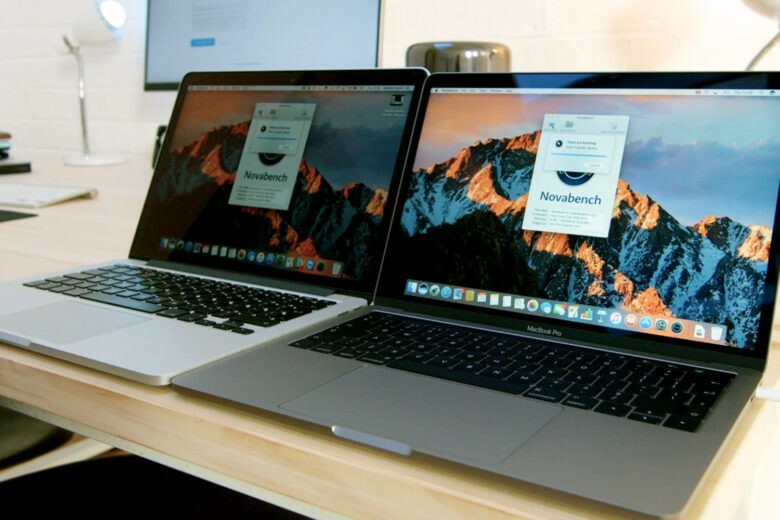 Cult of Mac put the entry-level 2015 and 2016 MacBook Pros head to head to see if it’s worth snapping up a shiny new Touch Bar machine. You can see the MacBook Pro showdown in our video below. Or read on for a summary of how the two Apple laptops compare in the real world. Place both MacBooks side by side, and the first thing that stands out is the sleeker design with the thinner bezels on the new MacBook Pro. There’s no argument that there’s an upgrade to the MacBook’s looks. Both displays have a resolution of 2,560 by 1,600, but the display on the new MacBook Pro is 200 nits brighter than the previous display, which means it’s visibly brighter when compared to the 2015 model. In addition, the 2016 MacBook Pro boasts a wide color gamut (P3), so the screen shows a great increase in saturation. Even with the stock macOS wallpaper, the differences are clear. The oranges and blues are much more vibrant. And with the wider contrast ratio, you can see more crevices and cracks in the rocks. It’s simply outstanding. The 2016 MacBook Pro with Touch Bar that I tested came with the slowest processor, a 2.9GHz dual-core Intel Core i5. The 2015 MacBook Pro packed a 2.7GHz dual-core Intel Core i5. Both had 8GB of RAM inside. Boot times on the dueling MacBook Pros came in almost identical. Running BlackMagic’s disk speed test shows that the new SSD is much faster, though. Read speed surpasses 2GB per second in the newer model, maxing out the test itself, with the older MacBook coming in at 1.4GB per second. Write speeds also show a great increase, with 1.3GB per second for the 2016 MacBook versus 680mbs on the old model. That means booting up, installing software and opening applications will all be snappier on the new MacBook. Running a Novabench test shows that the increase in performance isn’t as great as most of us would like, though. On that test, the 2016 MacBook Pro barely squeaks out a win: It scores 727, versus the 2015 MacBook Pro’s 707. The main increase for the new MacBook comes in graphics performance: It manages 149fps on Novabench’s 3-D graphics test, compared to the 2015 model’s 95fps. Still, everything you do on the new MacBook Pro will obviously be faster. The 2016 MacBook Pro sports Apple’s new low-profile keyboard, an upgrade to the one found in the 12-inch MacBook. As I mentioned in my full 2016 MacBook Pro review, this second-gen butterfly mechanism feels great to type on, but the older MacBook Pro keyboard definitely delivers more feedback. It just takes a little while to get used to. The new MacBook Pro also comes with a Force Touch trackpad that’s almost double the size of the previous one. It’s nonmechanical, relying instead on haptic feedback. It’s easily the best trackpad I’ve ever used, but it takes time to get used to — and to learn to stop leaning on it while using it. The MacBook Pro’s palm-rejection technology combat this, but I’ve found the trackpad still recognizes my hands from time to time. Apple’s innovative new Touch Bar, a thin OLED strip that replaces the traditional top row of function keys, acts as a secondary display. It customizes to whatever app you’re using (assuming the app supports it) and also enables Touch ID on the Mac for the first time. The most controversial part of the new MacBook Pro is easily the lack of conventional ports. Apple replaced all of the previous MacBook Pro’s SD card slot and its USB, HDMI and Thunderbolt ports with four USB-C ports. Until the rest of the world catches up, you’re going to need adapters — but in my opinion, the benefits of going USB-C are too good to ignore. On top of all of that, the 2016 MacBook Pro also packs improved speakers. In addition to being slightly louder, they sound much clearer and deliver more bass. Should you upgrade to 2016 MacBook Pro? Despite all the new features and undeniable upgrades the 2016 MacBook Pro offers, I’d still go for the older model. The new machine doesn’t seem dramatically quicker, and you won’t find yourself in a USB-C pickle as the rest of the world races to catch up with the hot new port. Plus, the prices of the 2015 MacBook Pro will fall as Apple begins to produce fewer of them, so you’ll be able to hunt down a bargain. For me, it’s a no-brainer. If you’d like to see my full review of the new MacBook Pro, check out the video below. Make sure to subscribe to Cult of Mac’s YouTube channel to stay up-to-date with all our latest videos.